Jeffrey McMurtrie is one of the speakers at this year's TEDxAlgonquinPark. 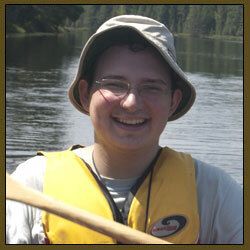 Jeff first visited Algonquin Park when he was eight. He fell in love with it and has since been back many, many times. He has spent over 500 days exploring the park in order to create a highly detailed map—Jeff’s Map—which he offers up for free online so that others can explore Algonquin Park, too. Jeff lives in Toronto. I think it speaks to the fact that we all need to try and step back and think more actively. It's all too easy to fall into the trap of zoning out and doing things the way they're 'supposed to be done'. But that just leads to mediocrity. Exploring off the beaten path. It all started when some friends who'd been canoeing in Algonquin for 50 years asked if I wanted to go along with them on a bushwhack to a small lake away from a canoe route. Right away the whole concept of going places that so few others have been really intrigued me. Now most of my trips involve trekking to a lake or two nearby my route or retracing an old route in its entirety. I'm young and often l don't know any better. That leads to a lot of discovering 'what not to do,' but it frequently also frees me from the assumptions and baggage that come with knowing the 'right' way of doing things. Somewhat related to the last question - making mistakes isn't a bad thing. In fact, every time you make a mistake you're just that much closer to finding the right answer. All too often people see mistakes as a deficiency of character when in fact they're just a part of learning. Without making mistakes we can't improve. 5. Without revealing the theme of your TEDxAlgonquinParkTalk, tell us the one thing you hope people will do after they hear you speak. Approach problems with a more open mindset. That's a pretty lofty goal - after all, it's basically asking someone to change the way they interact with the world all because of a talk they watched. But I think that all too often we're limited not by our abilities, but by our preconceptions, and I think that sometimes all we need is someone to remind us of that.